I interrupt my food dehydrator love fest to bring you a report from my dental odyssey. Instead of the gorey details or the latest scientific debate on what the best procedures are, I’d like to share something that came to me almost a month ago, as I was walking with Romeo and mulling over the dire situation the first dentist I went to see had described. According to his assessment, the tooth that had sent me to get it checked would require removal by an oral surgeon. And that was just the beginning. It was easy to be overwhelmed and frightened. Instead, however, as I wandered over old sidewalks and under old trees, I started to see the roots of this seemingly doomed tooth filled with tiny dots of sparkling colored light healing all the decay and bacteria. It was so pretty that I couldn’t stop watching. I began to replay this image over and over in my head. It was comforting amidst all the serious decisions before me. Added to that came the image of being able once again to bite into a whole carrot on that tooth. And see it wearing a shining crown. These were so funny to me that I laughed each time I thought of them. All I had to say to myself was “carrot” and “crown” and I started to giggle. I decided such playfulness could only help the situation. There’s been many times in my life when simply being able to visualize a positive outcome, usually in some shorthand of playful imagery, and repeat it to myself, has seemed to turn things around. For instance, long ago in a Spring when my son was just three and my husband and I were separating. I was scheduled to be observed while teaching by someone who had a reputation for being really nice during and after the observation, then writing up a terrible evaluation. There was no way around this, everyone who had been observed by her had claimed. I was not scheduled to be observed until nearly the end of the quarter. The way I saw it was that if I chose to dwell on this I would simply be unable to function at all, let alone teach the classes I needed to teach and figure out life on my own. So each time I thought of being observed by this person, I saw it coming out positively, beyond anyone’s wildest expectations. People’s mouths open in shock that I had indeed gotten a fair and positive evaluation. Whenever it came up in my mind, or I heard someone say something terrible about my evaluator, I just went right to my positive image. A couple of weeks before I was to be observed, this person gave me a call. “Maria,” she said, “I know I’m scheduled to come and see you soon, but I’m sorry to say I have to be away then. You’re such an experienced teacher, would you mind if we just skipped it?” And that was that. Sometimes it can seem daunting to try to think in positive images. Our minds can get all tangled up in whether we are doing it right or what to pick. The way it works for me is not to think too much about it, but notice the details I come across that, as Joan Didion once wrote, “shimmer around the edges.” For instance, in my reading about tooth health on the internet, I came across a statement that asserted teeth are going through a constant demineralization and remineralization process via our saliva. For some reason that image “shimmered” for me. I loved it. A tidal pattern in my very own mouth! I’m sure that attraction, along with my love of gemstones and crystals, contributed to the image of my happy tooth that seemed to come from nowhere. Secondly, I try to be playful. I try to be willing to take my imagination in the opposite direction of what a forceful opinion from the experts is maintaining, especially if it is full of doom and gloom. The image of me biting down on a carrot in the face of the first dentist’s statement that my tooth was a time bomb made me feel I had the temerity to be a David in the face of a Goliath. And it was so crazy it made me laugh. For me, that’s always a good sign an image is a keeper. Another image I realized I had in my head was an appointment with my old dentist, probably about 5 years ago. In it I felt comfortable sitting in the dentist chair as we talked about how to take care of my teeth, and laughed about a broken tooth that was giving me absolutely no problem. After a while I realized that image was perhaps suggesting to me that I ought to go back and talk to him again, get a second opinion. The only reason I had ended up at this new dentist was that he was closer. I could walk to his office and not have to ask anyone for a ride. And he had a reputation for being the most “wholistic” dentist in town, which I had (wrongly) assumed meant less intervention, not more. So I went back to my old dentist and got my second opinion from him. He indicated there was a chance we could save my tooth. And I continued to visualize the colors sparkling in the roots. And chomping on a carrot. And getting “crowned.” The night before the appointment when we would take a look and know one way or the other how to proceed, I decided it couldn’t hurt to externalize this image that was playing in my head every day. 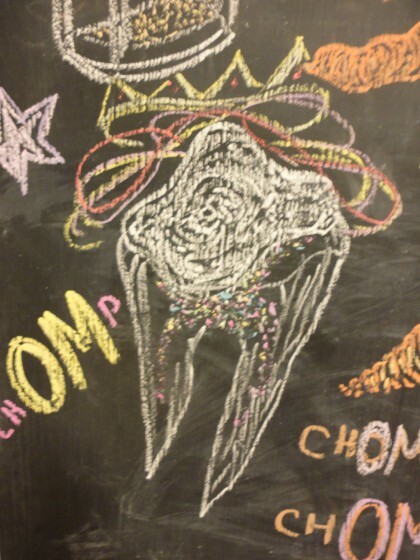 So I drew it on my chalkboard in a playful way, which you see at the top of this post. I started out writing the word “chomp” to go with the carrot, and as I did that, I realized it contained the sacred sound “OM.” So I made that bigger in the middle of the word. And I giggled the whole time I drew. The next day as a friend drove me to my appointment, we ended up laughing about it from yet another angle. I had said something like “I just want to give this tooth a chance” which always made me giggle when i said it, and then my friend responded by saying “You sound like the song–‘all we are saying, is give peace a chance” only you want to give your tooth a chance–in a peaceful way.” So I went into the office with a smile from that image, too. In the chair with my former dentist presiding, a better than anticipated scenario played out. It turns out things are in better shape than even he anticipated, good enough to do the work we needed to do in a more permanent way than he had initially suggested. I can keep my tooth for now, and with any luck and some good care, for a long long while. In the weeks while I waited for the right course of action to become clear to me, I began to take extra careful care of my teeth. Much to my amusement, this included falling in love with the water pik. I’ve traditionally avoided such high tech approaches because all the buzzing usually really bothers my nerves. My surprise at how much I loved it made me feel like a monk who comes out of a cave and discovers she loves to play games on her smart phone. This made me laugh all the more. It also included eating the simplest of simple whole foods, low acid if possible, and making sure to have natural antibiotic and detox aids like fresh grated garlic and nori at my meals. Even without freely chomping on a whole carrot, there’s plenty of whole food goodness to be had. These potatoes aren’t particularly lovely to look at like Susan’s Waffle Iron Hash Browns are, but they are nutritious, easy to chew and delicious They are good “plain” or with salsa or ketchup, but I was trying avoid those sugary salty processed things because they are by nature highly acidic. So instead I piled them up with garlic, a bit of mashed avocado, some nori and any other veggies I had on hand. One night it was steamed chard and corn kernels from the CSA. 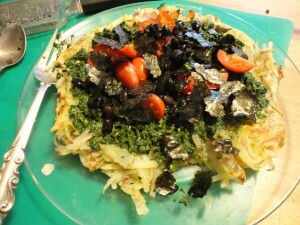 The version you see here is piled with easy healthy spinach pesto, nori, black beans and tomatoes. So here’s the recipe, so to speak. It’s really more of a strategy. The way to cook the hash browns is straight from Mary McDougall. I’ll include the strategy for the pesto, too. for one person, 1 large or two medium yukon gold potatoes (or whatever kind you like best), shredded in the food processor or a hand grater. Put everything for the spinach pesto in the food processor and process until smooth. Store in a jar in the fridge. Heat a ten inch non-stick skillet on medium. 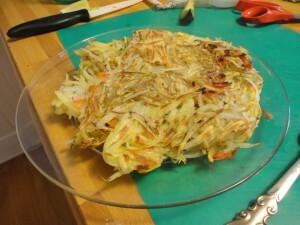 Once it’s hot, put the shredded potatoes into it. Sprinkle them with garlic granules, rosemary and oregano. You can add some chopped pepper, too, if you like (I did). Flatten them out with a spatula to fill the pan and cover. Let them steam for 5-8 minutes, or until they are golden and you can flip them over like a big pancake. Flatten again with the spatula, cover, and let cook for another 5 minutes, or until golden. It helps if you use a glass lid, because then you can see when they have stopped steaming actively. That’s a good time to flip them. With a big spatula, lift them carefully out of the skillet and onto a plate. I know Dr. McDougall always says “It’s the Food”–and it IS the food. But it’s also how I see my situation, and how I use my imagination to help me clarify what I believe is happening, what can happen, and how to best help it happen. A little positive thinking never hurts. And the food helps the brain be in the position to find those positive thoughts and images and stick with them. They “crown” each other, part of the same continuum toward greater wholeness and healing. That’s how I give my teeth–and my peace of mind–a chance. ChOMp. ChOMp. It’s so wild what can be done with a little nudge here and there and some playful attention! Though thoughts (seem to!) be but little, they are fierce! And may I say, that chalk drawing and all your playfulness made me snarf my tea from laughing! I’m so happy to hear that you can keep your tooth!! Dental work can be pretty terrifying. Sometimes I have issues with positive imagery; I’m always afraid of the disappointment if/when it doesn’t turn out that way, so I’ve always been a “prepare for the worst” kind of person. But the past couple years, I’ve been making more of an effort to change that thinking – because the mind is an amazing thing. You’re right – a little positivity never hurt! I love this hashbrown thing- it’s like a different kind of baked potato, with more crisp, but a seemingly infinite amount of topping possibilities. I often use par-boiled potatoes, though, it helps crisp up a little better. But then again, a lot of times I don’t because I don’t think ahead enough and have only raw potatoes. 🙂 Your pesto sounds delish! I’ve never made spinach pesto… Hope you’re crunching on carrots in no time! Happy dance that you can keep your tooth!!! Also happy you found your way back to your dentist. Sometimes, even is it’s further away, when it works, don’t change it. Love the drawing of your visualisation. The OM is a stroke of genius! WOW! Thank you for this! We had the McD hashbrowns this morning with the regular ole chopped onions and yellow bell peppers. So glad to have another variation to try. It sounds so yummy Maria! Love spinach and the thought of making pesto out of it. Thank goodness there are people like you (so creative) to help the rest of us! Maria, this was the perfect post for me to read today. I’ve had a bit of anxiety over some problems with my house the past couple days, and reading about your playful images of your tooth brought to mind a cartoon image of me giving my house a big ‘ol squishy hug. I giggled and the anxiety melted away. Still some challenges ahead but I was able to take a deep breath and relax. Thank you!